If you watch HGTV or read home magazines, you probably have heard of Sarah Susanka, celebrated architect and author of the Not So Big series of books. Susanka, in the proverbial right place at the right time, published her first book “The Not So Big House” in 1998. It called for the end of the McMansion and advocated the idea of building smaller, higher quality homes. Ultimately her book started a movement that changed the focus on what a house needs to be. 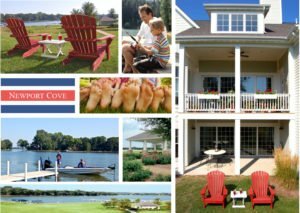 With the new economic realities of the 21st century, Susanka’s message became even more meaningful to homebuyers and builders, including those of us building the Newport Cove community. By speaking against sprawl and faux mansions, Susanka gave voice to the fact that not everyone wants to live in excess. As a result, thoughtfully designed homes proportioned to one’s actual lifestyle have been consistently gaining market approval and success. Articles proclaiming the “death of the McMansion” are found throughout builder trade magazines. The “Not So Big” philosophy of home building works for homebuyers on many levels: financial, environmental and personal. Affordability, according to Susanka, can be as simple as taking inventory of what you really need. Will you use it? If not, forget it. Rather than increasing costly square footage, put money into enhancing the quality of space. Builders can make less feel like more by using varied ceiling heights, open floor plans and architectural details. What is needed is not size, but a custom-designed space that is personalized for the owners. Once those owners are able to define what they need, their ideal home becomes more easy to afford. A sense of home, sought by so many, can be achieved. Environmental awareness can reduce home costs and protect the eco-system. Twenty percent of all carbon emissions come from existing housing stock. “Leaky” houses have an enormous environmental impact. New houses, built according to today’s energy-efficient standards and using the latest in building technology, are less costly to operate and save precious resources. Beauty matters, too. A house may be efficient and affordable, but if it’s not pleasing, its owners will not care enough about it to take care of it. When a home offers a sanctuary for its occupants, it becomes a place of refuge. And, that’s where personalized and universal design concepts come into play. For example, a niche designed for one’s family portraits can be a source of joy for a homeowner. Or, a wide entry door with no steps ensures that residents can age gracefully in the home, but also becomes a plus for baby strollers and moving furniture. At Newport Cove we recognize that everyone uses a kitchen differently, so we work with our buyers to design their personalized kitchen layouts.